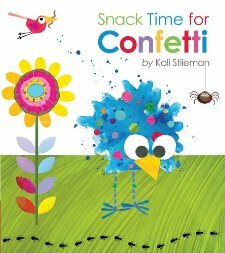 Snack Time for Confetti is the second book we have enjoyed by Kali Stileman (the first being Roly-Poly Egg ). Her birds are so bright, colorful and cheerful! (And also unique. Very unique!) In this new story, Confetti is a hungry baby bird who is off in search of some yummy food to eat. The giraffe recommends leaves, which Confetti does not like. The elephant recommends fruits and veggies which is also not very yummy. The monkey recommends some nuts which are flatly rejected. Confetti is, by now, very, VERY hungry. Thankfully mother bird arrives with some delicious bugs and all turns out well in the end. Again this one is cute and colorful. Not heavy on story, but very fun visually! We happen to have a fabulous local Farmers' Market which we enjoy going to throughout the summer months. So this new title - Farmers' Market Day - had the appeal of familiarity. 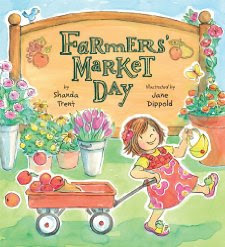 Written by Shanda Trent and illustrated by Jane Dippold, we meet a young girl who is very enthusiastic about her upcoming outing to the local Farmers' Market. (She is so excited that she wakes her parents up. This does not happen in our household. And I hope it never does.) The girl bounces from booth to booth enjoying the sites and sounds of the market. It being a very thrilling place, I can relate to being excited about all the fresh foods and possibilities which then exist in the kitchen upon one's return home. If you are at all enamored with the idea of going to Farmers' Market or in anyway wish to promote the concept to your young readers, this is definitely the book for you! One of my childrens' favorite things about our local market? : The worms from the local worm farm. One of my favorite things? The cheese. And remarkably cheap, huge, fresh and delicious heads of lettuce! Bookworm3 (age 2) pulled this book out of the Tiger Tales box and it is now her reigning favorite. We've probably read it to her about 15 million times. (I never exaggerate.) 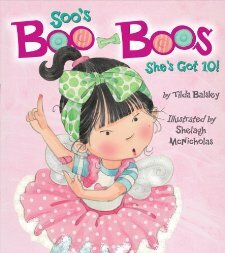 She absolutely loves Soo's Boo-Boos which she refers to as the "owie" book that has "band-aids." Soo has 10 boo-boos of varying sorts. She counts them out for her mother, from the scratch which is almost bleeding to the too-tight pony tail. Her mother specializes in boo-boo care and tends to each and every boo-boo with the attention that it deserves, from baind-aids to kisses. It's a sweet book about a parent who pays attention to even the smallest of their child's greatest concerns. I rather do like it but no where near as much as my daughter does. She hunts it out when I hide it. She requests it specifically. That can be translated to mean: we rather recommend this particular title. 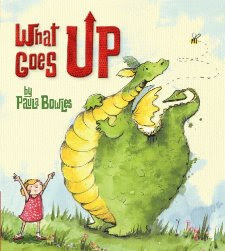 Last, but most certainly not least, there is What Goes Up by Paula Bowles. Technically you could say that this is a story about believing in yourself but you can just as soon ignore the message as you like. (Not that I think "believing in yourself" is bad, per se, but I prefer to couch it as having confidence in the person God made you and the gifts which He has given you because I think that is more accurate.) At any rate, this is the story of a dragon named Martin and this fact alone is cool because that's our pastor's name. Please note that we think of our pastor as being a dragon at all but the character's name makes the story more personable to my boys. (Heh.) Martin is sad because he cannot fly. He wants to fly. He tries to fly. But he cannot seem to stay up in the air. He is constantly sighing, "What goes up must come down" which is now my four year old's favorite thing to say, coincidentally. The children in the story are big fans of Martin and they want to encourage him so they practice flapping their "wings" (i.e., arms) and running around with him to practice the art of flying. Unbeknownst to Martin, during this time of training, his wings are growing and becoming stronger until one day it is realized that what goes up might very well be able to stay up after all! It's a cute book and we have plenty of reasons to like it so we recommend it as well. Just some new titles to have fun with if you like! We sure having fun with them and many thanks to Tiger Tales for sending them our direction in exchange for sharing our honest thoughts! FUN! I love how excited Tiger Tales makes me about children's books. Thank you for sharing! Looks like another great batch of books. I don't usually see them at our library, though--bummer!